Jonathan Davis is Vice-President for External Relations at the Interdisciplinary Center, Herzliya, Israel’s first private university. 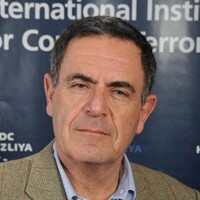 He heads the Raphael Recanati International School and is a Member of the Advisory Board of the International Policy Institute for Counter-Terrorism. Mr. Davis also serves as a Lieutenant Colonel (Res) in the IDF Spokesman’s office. Jonathan served in a paratrooper reconnaissance unit that was commanded by former Minister of Defense Shaul Mofaz. This unit executed many behind-the-lines missions, including a mission on the Syrian-Iraqi border during the 1973 Yom Kippur War. He served as a reservist paratrooper during the first Lebanon war. He was an IDF Spokesperson during the intifada and the 2nd Lebanon war. Mr. Davis was an active participant in the rescue of Ethiopian Jewry during “Operation Solomon”. In 1978 he served as an emissary of the Prime Minister’s office in the Former Soviet Union, visiting Stalingrad, Moscow and Uzbekistan, while meeting Jewish activists. Mr. Davis also served as emissary for the Jewish Agency for Israel in Cape Town, Boston, and Rome. Born in England and raised in the United States, Mr. Davis was educated at Columbia University, the Jewish Theological Seminary, the Hebrew University of Jerusalem and Tel Aviv University. Mr. Davis is married with four children and 5 grandchildren. He lives in Kochav Yair, a community located in the Sharon region. His hobby is mountain biking, and he rides extensively with the IDC Executive Education CEO biking group.